Commercial Buildings designed and erected by REIDsteel include steel framed superstores, showrooms, multi-storey office blocks, hotels, apartments. If you would like a price for a commercial building in any location, please fill out our Enquiry Form or contact us directly. We do the complete structural design. 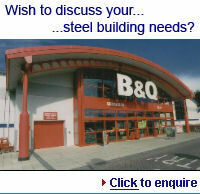 We use only the highest quality British Steel which can be supplied hot dip galvanised if required. We can arrange shipment and erection of industrial steel buildings to most countries in the world.